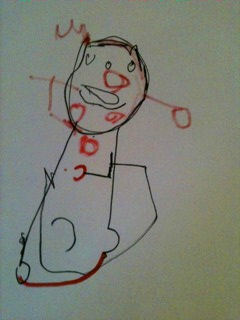 Sticky Fingers has challenged us to add a picture that our children have drawn of us. She is compiling them in a linky gallery. Ask your child – their age doesn’t matter – to draw a picture of you. Pass it on to your friends/enemies if you want to. Then when you’ve done, go to Taras Post here and add yours to the Linky so we can all laugh. « 5 Things That Make You Feel Good. This is so cute, definitely worthy of being framed! All these posts with squiggly little pics are gorgeous!! !